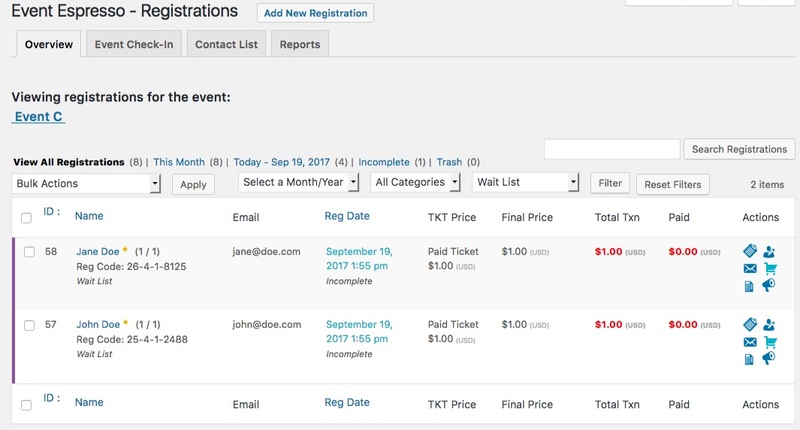 The Wait List Manager add-on allows you to automate the process of capturing wait list signups when your events sell out. 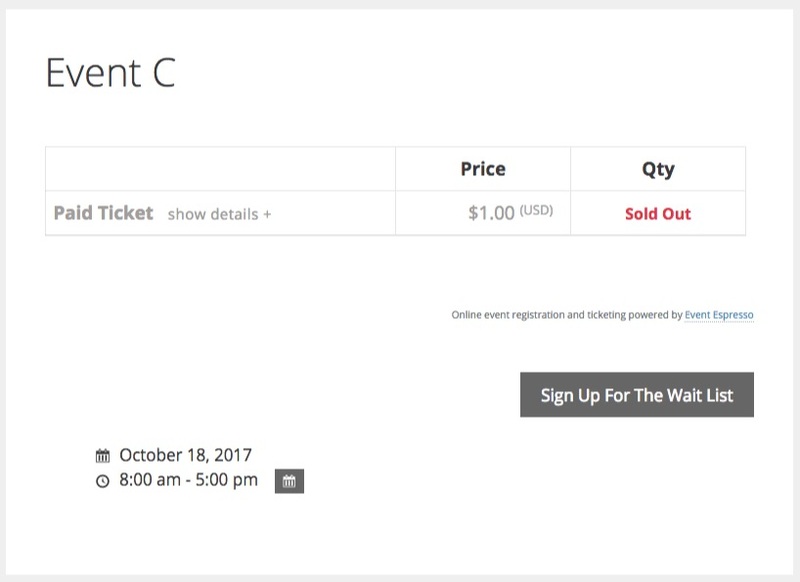 If the wait list is activated on an event, and the event sells out, a button will automatically display on the event details page that encourages attendees to join a wait list. 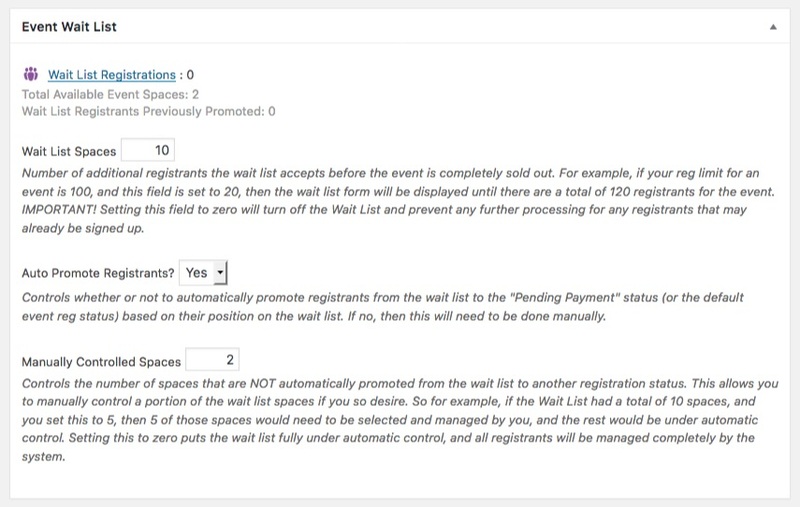 If an attendee joins the wait list and someone cancels, the wait list attendee can be auto-promoted to the next available spot. Need to Buy a Support License for the Wait List Add-on? This add-on requires Event Espresso 4.9.49 or newer. It cannot be used with old versions of Event Espresso 4. Download the latest version of the Wait List add-on from your Event Espresso account. Login to your WP dashboard and go to Event Espresso –> Events –> Choose an event. You’ll now be viewing the overview screen for the selected event. Scroll about half way down the page, until you see the Event Wait List settings. 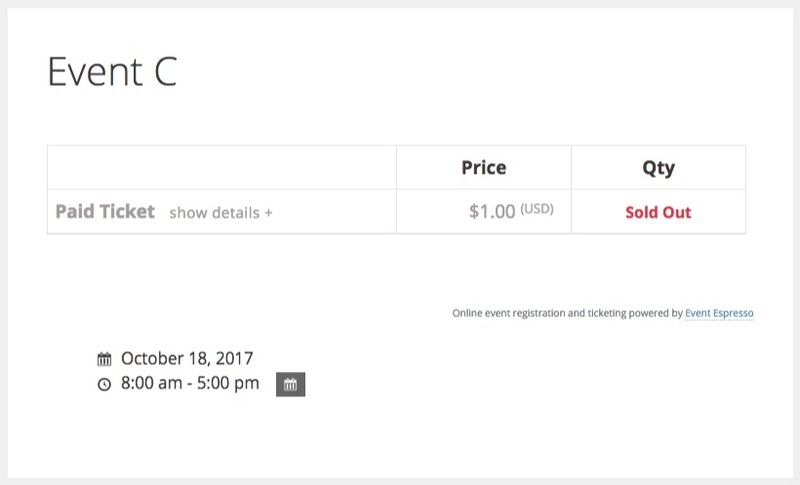 Once you’ve added a wait list to an event by adjusting the value of the “Wait List Spaces” setting and the event sells out, the ticket selector is replaced and a button will be displayed on the event details page. 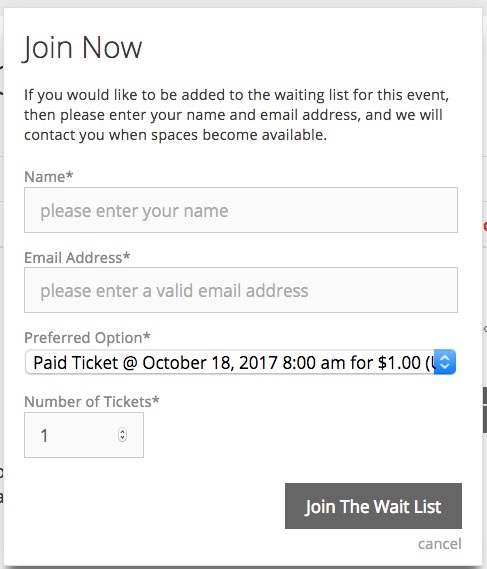 The “Sign Up For The Wait List” button allows potential attendees to sign-up to be on the wait list if spaces open up. Spaces can open up if someone cancels or is removed from the event list. Once registrants are added to the wait list, you can easily follow-up with them or promote their registration to approved, pending payment, and more, if any spaces open up for the event. Here you can get an overview of wait list registrations, promote registrations, view registrant information, and resend notifications. From there you can change the registration status and send related messages. 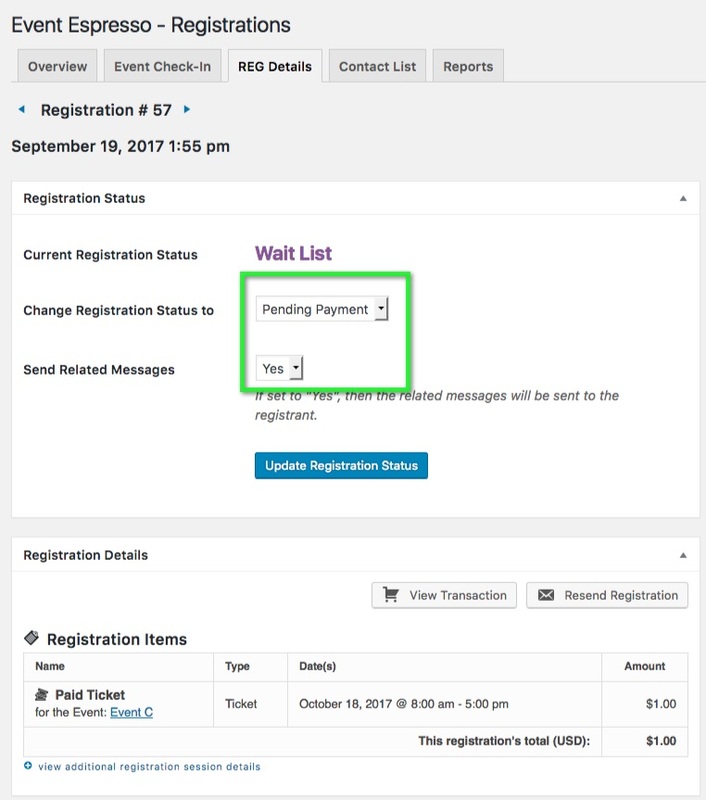 If you are running a paid event, you can use the “Pending Payment” option to make sure the attendees pay before taking a spot in the registration list. However, if you’ve promoted multiple attendees to “Pending Payment” and only have a limited number of spaces, then the first attendees to pay will receive their spot on the “Approved” registration list. Reducing available spaces after promoting registrants should be avoided at all costs. 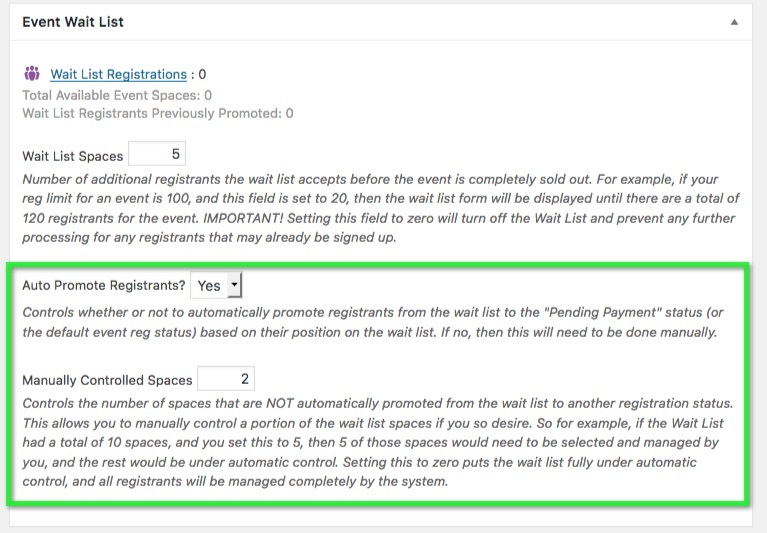 The Wait List Manager auto-promotion setting helps you by making sure wait list registrations are automatically promoted whenever a space opens up in the event. If you use the bulk cancel action to cancel registrations you’ll need to refresh the event editor page for the sold out event to trigger the auto-promotion of wait list registrations. You can also leave some spaces on manual control if desired. The Wait List Manager creates three additional messages that send when your customers sign-up for a wait list. To edit and manage the Wait List messages, login to your WP dashboard and go to Event Espresso –> Messages –> Default Message Templates. From there you can edit the content of each message to meet your needs. Are you running a current version of Event Espresso 4? This add-on needs at least version 4.9.49.p to activate. This plugin does not create any new menus in the WordPress admin screen. It uses the messages setting screen along with the event editor for Event Espresso.